CoreRFID is often asked to carry out trials of different RFID technologies to assess how successful these will be in a real world application. Often it is difficult to predict just how effective RFID will be in any given circumstance. The trials carried out by CoreRFID provide useful data and, while the results are, of course, specific to the circumstances of the individual trial, the data provides a useful insight into the variability that can occur in RFID success rates and the steps that need to be taken when planning for an RFID installation. Successful read rates depend on a number of factors and some of these may not be under the user’s control. As an expert in this area, CoreRFID is happy to help users with planning or carrying out RFID trials by sharing the results of this study. The tag design and its antenna. The material to which the tag is attached. The extent to which the tag orientation can be controlled. The extent to which the environment can be controlled. Changing any one of these will result in changes to the achievable read distance. 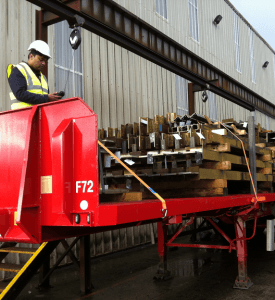 As part of the planning for a possible deployment of RFID within the construction industry, CoreRFID was asked to carry out a trial which would demonstrate the ease with which a range of different tags might be used for the control of steel components moving between the steel stock holding yard, the building site and then on to the building itself. The steel components were of varying sizes and positions on a flatbed trailer. The trial was designed to asses a number of different tag types and reader approaches including the use of both hand-held reading devices and gateway type readers, so called “portals.” Three types of tag all operating in the UHF wave band were tested (one general purpose passive tag, a passive tag specifically designed for mount on metal and an active tag). Three types of reader were tested; a handheld computer with integrated RFID reader and UHF antenna, and two different fixed point readers each working with a gateway antenna. Trials with the handheld we conducted by moving the reader past the tags at a relatively close ranges and with a controlled orientation between the tag and the reader’s antenna. Trials with the fixed point readers were by moving the steel components on a trailer past the reading station. The trials measured read success rates, providing an important indication of the issues needing to be explored in any planned application implementation. The test results are shown below. In trial # 4 the tags were attached to existing labels already in place on the steel components while for trials #3, 5. 6 and 7 the tag was mounted directly on the steel component itself. For the hand held readers, tag read distance was typically around one to two metres. For the fixed readers there was a gap of at least two metres between the tags and the antennas as the trailer moved past the tags. In all the trials, tags were mounted randomly of the steel components, ensuring tags were place both at the edges and middle of the trailer. What conclusions can be drawn from this simple experiment and what lessons can be learned for the planning of RFID projects? Firstly there is considerable variability in success rates with different tags, different readers and different technology approaches. It is evidently worthwhile carrying out such trials as this one before determining on a particular technology selection. Secondly the manner of tag attachment can be as important as the choice of devices (given the difference in the performance of identical products in two attachment scenarios in trials #4 and #5). Thirdly, that (in this case) careful selected passive technology tags and readers could match the performance of active tags costing four times that of the passive devices.